Leo Varadkar at last year's Ard Fheis in Cavan. THE FINE GAEL Ard Fheis is to be asked to vote on the introduction of a middle band for income tax. There are currently two tax brackets – 20% (the standard rate) and the balance of income is taxed at the higher band of 40%. In October’s Budget, the government tinkered with the bands, increasing the entry point to the higher rate of income tax for all earners by €750, raising it from €34,550 to €35,300 in the case of a single worker. The year before, the threshold for the higher rate of income tax was raised by €750 to €34,550. While the government have raised the existing band in the last two budgets, this weekend’s Ard Fheis being held in Citywest will be called to approve the introduction of a new band – a middle band for income tax between the 20% and 40% bands. Other countries have more than two bands. If you live in England, Wales or Northern Ireland, there are three marginal income tax bands – the 20% basic rate, the 40% higher rate and the 45% additional rate tax bracket. If you live in Scotland, there are five marginal income tax bands from the 2018/19 tax year – the starter rate of 19%, the 20% basic rate, the 21% intermediate rate, the 41% higher rate, and the 46% additional rate. Taoiseach Leo Varadkar has said in the past people on very modest incomes pay the highest rate of income tax. “The average person working full-time in Ireland, if you exclude students and people working part-time, earns around €40 to €45k a year. Those people pay income tax at the very highest rate. You get an increase, an increment, almost half is gone on tax and USC,” he said this year. The Taoiseach said last year’s Budget was aimed at helping middle-income earners, but some critics said the slight tinkering with the tax thresholds did not go far enough. On the issue of the rental crisis, one motion asks that the Árd Fheis “recognises the pressure that students and parents are under due to increasing student rents” and calls on them to endorse the plan for rent caps to be brought in for student accommodation. Another motion calls on the Fine Gael party to affirm “its commitment to home ownership” and its belief that it should be in the reach of citizens, and must be reflected in public policy. There are also calls for the Irish rental market to be “well-regulated in line with European best practice”. The motion states this is necessary so as to ensure tenants and landlords have clarity as to their rights and obligations. No mention of banks or vulture funds, but there is a motion calling for the continued resourcing and enhancement of the Abhaile service which provides assistance and supports to distressed mortgage holders. There are a number of motions on future referendums, with one motion calling Fine Gael to support a referendum to give all Irish citizens the right to vote in future presidential elections so as “to strengthen our links with citizens living outside of the State”. Social welfare features in one motion, with calls for Fine Gael to ensure that the current system of social welfare provision is “reformed” so as to ensure a way “back to employment so that those in jobless households may be integrated back into the workforce”. One motion deals with the introduction of a Digital Safety Commissioner with “real teeth”. Government is currently considering such a move, which has been called for by many child welfare groups and charities. However, social media companies such as Facebook has said it could threaten the freedom of expression. One motion addresses the harmful effects of drug addiction and the increasing use of drugs amongst Irish people. It raises the issue of the consequences of criminalising individuals and calls on Fine Gael to prioritise the treatment of these issues as a medical issue rather than a criminal problem. Party members will also call on its members to highlight its deep concern about the ease of gambling due to modern technology and the pervasiveness of gambling advertising. The members will vote on the introduction of legislation to end the practice of advertising of in game betting during sporting fixture, either online or on television. Other motions deal with reviewing the current legislation around hate crime, the conditions in Direct Provision as well as the opposition to any change to the Free Travel Pass. Members will also vote on whether the government should make it illegal for an employer to require a person to retire before the State retirement age, unless there are clear objective grounds to require such. They will also be asked to vote on whether local authorities should be given the powers to limit or ban high emission cars and other vehicles from city centres, as has been done in Hamburg and London. 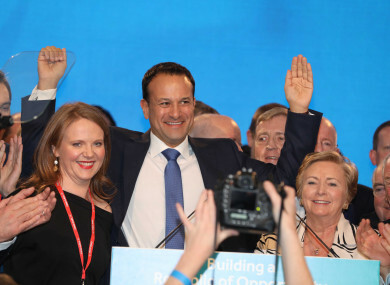 The Fine Gael Ard Fheis kicks off on Friday evening and continues into Saturday. For all the updates follow @TJ_Politics. Email “Fine Gael Ard Fheis to vote on the introduction of a new middle band for income tax”. Feedback on “Fine Gael Ard Fheis to vote on the introduction of a new middle band for income tax”.